This week I was eating lunch in a cafe when I noticed a postcard advertising a yoga studio in the area. On the card were the words: October. Do something this month that scares you. 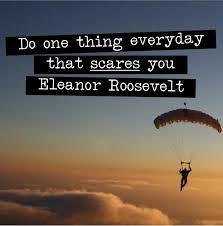 I live in a city wildly enthusiastic about Halloween but Eleanor Roosevelt’s thought to “do one thing everyday that scares you” came to mind when I read the card and I love that idea. So here we are with that idea as a theme for the month of October. I often think of fear and working through it is like running a race and having to build muscle in order to win it. I think fear and going through it gives you an opportunity to build muscle to win at life and get sharper, stronger, better at navigating the ups and downs. I read awhile ago that once out of college most people stop learning/reading great texts, challenging themselves mentally and provoking themselves with new ideas and thoughts. So perhaps thats similar to tackling fear, basically its about charting new waters that may incite fear in you simply because they are unknown to you rather than it really being something truly terrifying. So this week when my producing partner Holly and I began another re-write on the script which was making me panic a bit about how it was all going to shake out, I focused on the end result and that actually calmed the fearful thoughts. In the end its the same when I crossed the bridge that was a bit Indiana Jones-esque in Mexico, as soon as I looked down at the individual missing slats of wood and at the ravine and raging waters below I froze and stopped breathing, but keeping my eyes on the goal, the other side of the ravine, meant I could do it. Holding onto the same thought for the script has meant I’m not lost in a vortex of fear with details and stumbling blocks on the way to the goal. Sure you do but hope you don’t have to. This is a bit like my thought that focusing on the mountain can strand you in the shade of a problem instead of releasing you into the sunshine of God’s love. That’s my goal this month. Letting God help me move this mountain.